Equibase reports at least three horses as “broke down” Friday; “broke down,” virtually without exception, is an industry euphemism for dead. The Humane Society of the United States of America……. where are you? The HSUSA has publicly declared that it does not support greyhound racing re the animal cruelty – inhumane. However, it is of the view that horseracing can be conducted humanely. It’s all on their website, its policies on both these exploitation of horses and dogs “activities” all in the name of gambling and human entertainment. The inhumane treatment of the innocent animals in the horse racing industry is inexcusable and unacceptable in today’s society. Clearly it has lost its social licence. If the CEO of the HSUSA, namely one Wayne Pacelle, sees fit to publicly contradict what the HSUSA stands for, then he is not a fit and proper person to hold such office and should be sacked! Just to clear the air in some of the terms used here, “Vanned Off” does not mean that the horse was euthanized. It simply means that the horse was taken off the track do to an injury that was either apparent to the jockey and the horse was pulled up, some injury to the horse requiring, for the ‘best interest of the horse ‘ veterinary services so the horse is transferred to the med barn by the equine ambulance. I personally own three racehorses. My horses are not drugged, do not use performance enhancing medications. Yes unfortunately there are deaths among racehorses. People who break the rules. There are rules in place and sanctions for the violators. No sport has a perfectly clean record. I have yet to see any reports from you in regards to barrel horses, hunter jumpers etc. I do defend Thoroughbred racing. I love the sport. There is good and bad in everything. I tell you what, come walk my shed row, see my horses, drug test them. There isn’t too many racehorses that I don’t know that don’t eat better than their caretakers. So before you pass judgement on all of us, put in those 20 hour days, 7 days a week, 365 days a year. And you’ll see that a very small percentage break the rules. 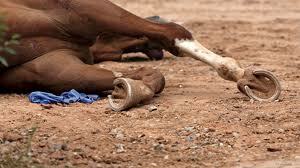 Fully aware of what “vanned off” means – a horse has suffered a serious injury and is unable to walk off the track. Depending on the circumstances of each horse (e.g. been performing poorly, has health issues, no longer viable, not worth spending money on to patch it up, fractured bone not fixable, horse in excruciating pain having suffered a catastrophic injury) the vast majority of these horses are euthanased. In most cases, rather than put the horse out of its agony on the track, they force the horse onto the van (I recall one had multiple fractures) to do the dirty deed out the back, out of view of the public. This inhumane policy is enacted purely to hide the sickening truth. There are some cases where a horse does survive but they are rare indeed. The rules in racing are a joke – they condone inhumane treatment of the horses e.g. Steve Asmussen/Steve Blasi re the NEHRO expose. Having worked at the coalface in the industry, 7th generation racing family, I base my comments on my personal experience, that of my family and friends and colleagues who’ve worked or are currently working in the industry. Lastly, Patrick’s KIA lists are indisputable factual evidence of the inhumane treatment of horses in horseracing. Christopher Gray – is this the Christopher Gray who had 3 starts in ’09 and 3 in ’10? Most recent start in 2010 at Suffolk Downs? Or do you now run your horses under a stable name?…or own percentages of racehorses in one of those partnerships, created so even a “poor man” can own a racehorse (Sport of Kings my a**)? No one needs to visit your barn – your horses are stalled for 23 hours/day just like every other horse at the track. No drugs? – so, no Lasix? Or any of the other 20-some LEGAL race day drugs? And if you think your claim about the horses eating better than their “caretakers” is a good thing, it’s not…not by a longshot. You see, I saw that type of owner year after year – could barely make rent or buy groceries, drove a beat-up truck, had on the same worn clothing at the races at night as they did at the barn in the morning. And their horses? – they didn’t receive the diagnostics they so badly needed because radiographs were “too much money!”…and they ran every week because a paycheck was badly needed to make rent, buy groceries…and their stall bedding was sparse because that, too, required money…and they were sold via the cheapest claiming race the track had or were given away in package deals to the licensed racing owner/kill buyer. Horses don’t belong with someone who must choose to feed himself last or his horse. Eventually (and it’s sooner rather than later), the voiceless, defenseless and dependent being suffers. You won’t see “reports [regarding] barrel horses, hunter jumpers, etc.” here…this is Horseracing Wrongs. Do you know a blog/site that covers the abuses in every equine discipline? One that updates and reports nearly daily with new, significant facts about each one? No, you do as other racing supporters have done when they comment here…try to deflect. We KNOW there are MANY animals being exploited and abused – the racehorses are just some of the unfortunate many. Horseracing Wrongs doesn’t address those other abuses…just as the TWH advocates who expose soring don’t address horse racing, and the advocates of the BLM-harassed wild horses don’t address horse racing, and the carriage horse advocates don’t address horse racing, and the marine animal advocates don’t address horse racing, and the advocates who battle puppy mills don’t address horse racing, etc, etc…are you getting my drift? Do all of those forums that expose abuse and exploitation of animals annoy you?…or just the one that exposes the industry YOU “love”? A “small percentage” are rule breakers? The bad apples? Well one of your own industry members strongly disagrees with you…“Our industry is permeated with those who have no regard for the welfare of the horse…The horse becomes only a tool for fulfilling their own agendas of WIN AT ALL COSTS. Until our value system changes and horses are treated like the living, breathing, majestic animals that they are, we will continue to diminish as an industry until we no longer exist. Most trainers have little or no investment in the horses they train, whether it is financial or emotional. They will run red light after red light in pushing that horse until it fails and then they will call the owner and spin him a story. Every vet will tell you that 90% of the major injuries have an existing underlying pathology that precedes the eventual failure yet those trainers will tell the owner that the horse ‘just took a bad step’ and ‘that’s horse racing.’ And what is sad is that most owners will accept it as the gospel.” – Bill Casner. Finally, “vanned off” is terminology we are very familiar with. Although Equibase did indicate Abeachindynasty and Infosec were both vanned off (in addition to “broke down”), Patrick never mentioned it. So I’m not certain who you believe you’re informing.